This coming weekend we will be observing Palm-Passion Sunday, which in the church year signals the beginning of Holy Week (Maundy Thursday with Jesus instituting the Last Supper “in remembrance,” Good Friday with Jesus going to the Cross “for our sin and salvation,” and the wonder of Easter Sunday with Jesus “overcoming sin, death, and the devil” for us, by his resurrection. This weekend will also conclude our Lenten Study on the book of Psalms, giving special focus to Psalm 31. At least this part of the psalm is without question, a lament. Can you feel the weariness of the psalmist? In “body and soul” the psalmist is absolutely spent … wearied right down to “my bones [that are] wasting away.” And so it is with Jesus in our first Gospel text for this coming weekend from Luke 19:28-40. Think on the fact that at this point in his life, as Jesus enters the gates of Jerusalem on that Palm-Passion Sunday (what in Jesus’ time, the Jewish tradition referred to as the beginning of Passover) … he’s doggedly spent himself in a ministry of healing, teaching, traveling, being ridiculed and challenged … day after day … for now some three years since his ministry began at his baptism. have always been] in thy hands; deliver me from the hand of my enemies and persecutors! My friends, think carefully and deeply with me on this … There are places in our hearts where only weakness can get in, where power and glory cannot enter. Knowing that, God has sent his Son in the likeness of a suffering servant (see our Old Testament lesson for this Sunday from Isaiah 50:4-9a), taking on our frail flesh and the sins of the world. And Christ, having laid aside his majesty and taking the form of a servant, being obedient even unto death on the cross, was crucified in weakness (see our Epistle lesson for this Sunday from Philippians 2:5-11). And on him God has laid the chastisement that has made us whole. So it is, that when we come to the end of ourselves that we are most ready for the saving, steadfast presence of God. And then, into the earthen vessel of our own weakness is poured the whole counsel of God. Yes, even in the weakness and weariness of life, what we are called to embrace there is a supreme strength because it is God’s strength. For when we are weak, then we are strong (II Corinthians 12:10b) – in Christ. “O bless the Lord, O my soul, and all that is within me” (Psalm 103:1)! 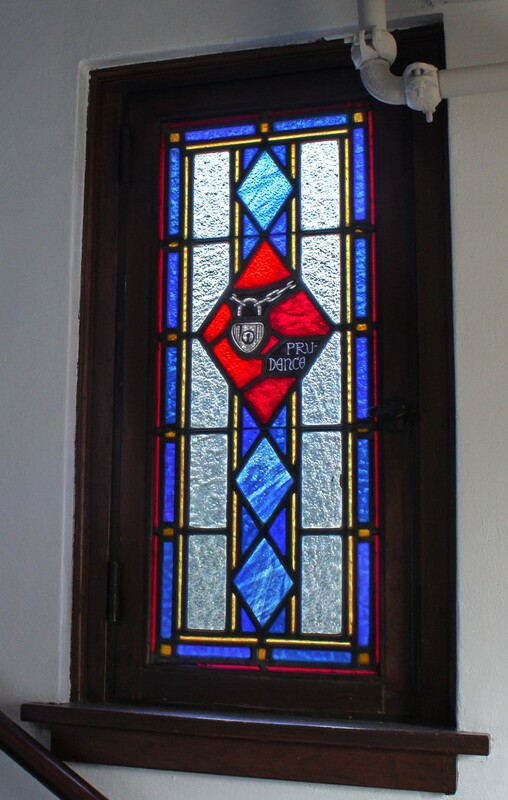 Have you ever noticed the “virtue windows” in the sanctuary narthex, where the doors lead us out to Dakota Avenue? Their unique messages and designs have always caught my eye, including this window celebrating the virtue of prudence. Prudence is one of those quiet, unassuming virtues that doesn’t get much attention in our modern culture, but I see this positive quality displayed in the lives of many of the folks I have come to care about at First Lutheran. When one exhibits prudence, one is behaving cautiously, wisely, and diligently—with a regard for the future. These are the grounds on which Judas attacks Mary of Bethany in this Sunday’s Gospel reading. He observes her anointing Jesus’ feet with costly perfume, and he (like a 90’s era Dana Carvey imitating President George H.W. Bush) waggles his finger and accuses, “That’s not prudent!” He points out that the perfume could have been sold and the money given to the poor—a bogus objection considering he was the one who regularly helped himself from the disciples’ common purse. Jesus defended Mary’s extravagant, generous gift. In doing so, perhaps Jesus shows us there is a need to be prudent with the use of prudence. It is good and right to live one’s life wisely and diligently, with a regard for the future and a healthy dose of self-control. But there are times when God’s love may compel us to actions that are less than prudent—especially for the sake of blessing others. The act of love given by Mary to Jesus—as she anointed his feet just before his burial—was beautiful and right, but it wasn’t prudent. So too, the love Jesus has for his own is not exactly prudent. The selfless, gracious mercy he gave to sinners would cost him his life. With this prodigal love of God in mind, I’ll be preparing my sermon for Sunday. Join me in pondering, and I hope to see you in church this weekend. P.S. Seminarian Adam Guthmiller will be delivering the sermon on Saturday, and I’ll be preaching on Sunday. Consider attending the Saturday service at 5 p.m., and come again to one of our services at 8, 9:30, or 11 on Sunday morning (and don’t forget we have the 11 o’clock KSFY broadcast and YouTube channel as well). Attending two services over the weekend, hmm. Wouldn’t be prudent….but could be good for the soul! In our gospel text for this coming weekend, we witness something akin to a group of angsty folk approaching Jesus at HyVee, pointing out all the horrific headlines on the tabloids at the check-out counter: “FBI Arrests Unabomber After Blowing Up Bridge on I-90 ~ 27 Dead” or “Scoutmaster Goes Bezerk With Bazooka At Tuthill Park.” (ala Luke 13:1) “So?” Jesus answers. “You think that because these [folks] suffered such a horrible death, they were some kind of super-sinners? No way! But unless you repent, you will all likewise perish” (ala Luke 13:2). There are at least two levels here. Level #2. Jesus’ response then to the crowd is not meant to aid reason or solve “the problem of evil.” But he’s disarming it. In an intervention aimed below his listener’s heads, Jesus touches the panic they have inside their hearts – about all the awful things that are going on all around them and us. He’s not going to honor the illusion that we can somehow protect ourselves by rationalizations or pointing fingers, but he does honor the vulnerability that our fear can open in our hearts. It’s not a bad thing for us to feel the full freight of our frailty in our lives. It’s not a bad thing when the law drives us toward the cross in seek of our tremendous need of forgiveness. It’s not a bad thing for all of us to count our breaths out in the cold and dark, not if it makes us turn to the saving light that this Lenten Season is leading us to. All this is to say: pay attention to this place that fear has torn open in your hearts. It’s a holy place. And yes, it may hurt you to be honest about what you see and feel. But it’s not the kind of hurt that leads only to death, but new life (cf. Proverbs 21:21; John 3:36, 20:31; Acts 11:18; Romans 6:4). And if we look to Jesus’ cross, we will see in the mystery of his death that we’ve always been home free – free from Pilate’s bloody goons and free from falling walls – by the power of Christ’s resurrection. God’s grace and peace to you in this Lenten Season.